When will be Billy Connolly's Tracks Across America next episode air date? Is Billy Connolly's Tracks Across America renewed or cancelled? 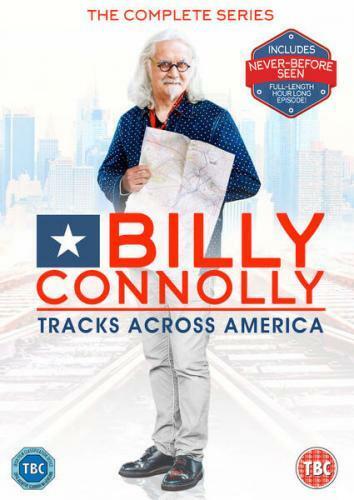 Where to countdown Billy Connolly's Tracks Across America air dates? Is Billy Connolly's Tracks Across America worth watching? Welcome to an epic journey that puts Billy Connolly in the company of three things he loves dearly – trains, America and his banjo.In these three episodes, Billy Connolly will circumnavigate the four corners of the United States on the magic carpet made of steel that is America's rail network.Beginning in Chicago and finishing in New York, Billy will head into the vast and astonishing landscapes that make up America's backyard. An epic 26 states and over 6,000 miles of cities, coast, mountains, desert and swamp.Rich in the romance of the American dream, this is a travelogue in the tracks of the pioneers who built a nation. A glimpse into modern America and the states we rarely get to see onscreen. It's a journey rich in people and places, chock-a-block full of moments you could only have in the company of Billy Connolly, a man who can move you to laughter and tears on the turn of a dime.A series painted in visuals straight from the silver screen, with Billy on the banjo strumming along to the ‘chug chug' rhythm of the ride. The first episode sees Billy travel from Chicago to Seattle on the mighty Empire Builder. Travelling from East to West, across six states, Billy stops off to witness a true slice of Americana at the Minnesota State Fair, where giant butter sculptures, corn beauty pageants and live animal births are just some of the bamboozling entertainment on offer. He tackles a world famous ‘juicy lucy' burger in Saint Paul before skirting the badlands of North Dakota to experience the highs and lows of an oil boom town. He marvels at the thousand upon thousand acres of uninterrupted prairieland before arriving at Montana's answer to Glasgow, Scotland. Glasgow, Montana is small town America in all its glory. And Montana is a land of cowboys and ranching families who have worked the terrain for generations. Billy's journey's end is in windswept Seattle - not in the glamorous tech city but Tent City, where many of Seattle's homeless live. Here, Billy is moved by the tales of its residents. Billy's adventure takes him into the jewel in the crown of America's rail network. Hurtling past jaw dropping vistas of land and sea – this is the West Coast and Pacific Ocean in all its cinematic glory. Beginning in Portland, Oregon with Farmer Tom, a prize winning vegetable farmer who has turned his green fingers to organic cannabis growing, next stop is the stunning California coast – home to a cacophonous elephant seal rookery - the largest in the world. Along the route Billy will hear the extraordinary tales of a real life hobo, who has been train hopping since the 1930's and he makes himself at home at Nitt Witt Ridge, one mans two-finger salute to architecture and town planning. From there, it's back on the train to the deserts of Arizona to meet the men and women on the frontline of US border control. Deep underground, Billy learns of America's biggest cold war secret and meets the former wing commander who literally had her finger on the button of ‘World War Three'. In El Paso, Texas Billy succumbs to the charms of an ‘exotico' luche libre wrestler and pays homage to the cowboy boot factory that made his beloved boots. The final part sees Billy travel from San Antonio Texas and up the soulful Crescent Route to New York. Kicking off in a spectacular fashion – a Friday night in Texas, which can mean only one thing: football. Billy chews hot dogs with the best of them at the ten thousand seat stadium where soccer moms, ambition and marching bands collide. From there it's on to the swamps of Louisiana where Billy braves an attack from jumping Asian carp and meets the genteel frog princesses of Rayne, the frog capital of the world. After a moving tribute at the graveside of one of Billy's heroes - Hank Williams - it's onto Birmingham, Alabama to hear the startling stories of the child crusaders who changed the course of history and segregation in the south. Billy's penultimate stop is Baltimore, but don't let a visit to the city's morgue put you off! Here Billy uncovers the incredible tale of the multi millionairess who became known as the Mother of CSI and her collection of creepy dollhouses. Billy Connolly's Tracks Across America next episode air date provides TVMaze for you. EpisoDate.com is your TV show guide to Countdown Billy Connolly's Tracks Across America Episode Air Dates and to stay in touch with Billy Connolly's Tracks Across America next episode Air Date and your others favorite TV Shows. Add the shows you like to a "Watchlist" and let the site take it from there.